I first saw Edward Scissorhands while I was teaching horticulture at LSU and have been cutting up in the garden ever since. It’s a bit ironic that I’m known for being heavy handed with the clippers in the garden, as it’s both who I am and who I’m not. First, let’s look at a little garden history. The French made snipping and clipping famous. They are legendary for perfectly coifed hedges, parterres, and topiary. They inherited this talent from the Romans and Italians, but this cut-leaf art came home to root in France. The English on the other hand, rebelled against all things French and made famous the jardin anglais which was “all natural” with curving lines, meandering brooks, and rolling hills. The English garden embraced the cottage gardens of the poor which billowed forth with unkempt color. Ironically most of the world eventually settled on a combination of these two design influences with ridged French bones filled with English floral exuberance. I am drawn to both styles, as I’m a neat, orderly person trapped inside a messy body! Therefore, my whole life is a constant battle between both forces. This internal struggle actually works quite well for me, as nothing in life stays neat and orderly. So, I clip and mow; and when it’s not neat anymore, I clip and mow again. I suppose that’s one reason I’ve always liked mowing lawns, trimming hedges, and getting my hair cut. These are things that we can put in order and step back and say “well done.” And they don’t require a lot of thought; just action. Mowing and clipping provide me a sense of satisfaction and well-being. 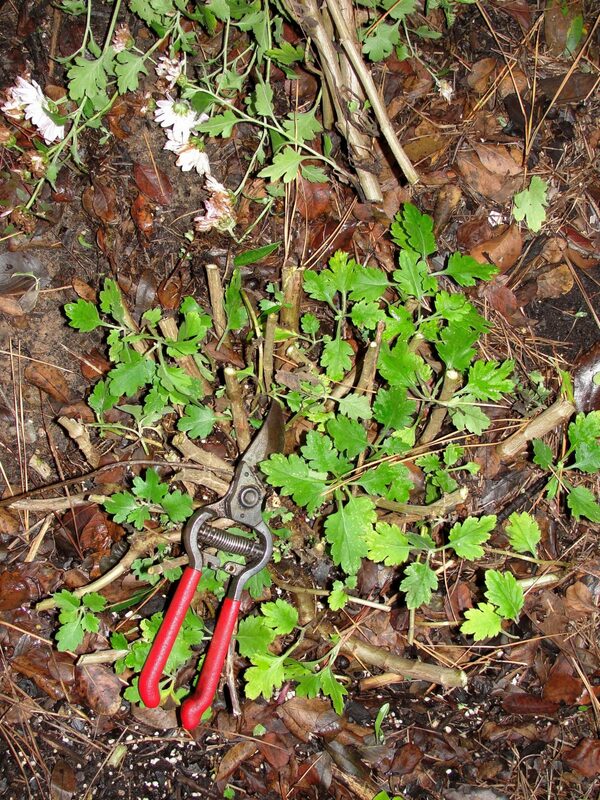 When it comes to shearing in the landscape, most gardeners are familiar with both lawns and hedges. Naturally (or unnaturally in these cases) these are easy to understand, as you are just shearing geometric shapes or flat planes. But what I want to cover is herbaceous (non-woody) plant material. We all know that shrubs come in sorts that bloom on old wood (azalea, camellia, forsythia) which have to be pruned after they bloom, since the buds are already set during the winter time. And then there are those that bloom on new wood (rose, althea, crapemyrtle) that can be pruned when they are dormant, before they bloom, since the buds are set on new growth. The herbaceous world has its own set of rules however. 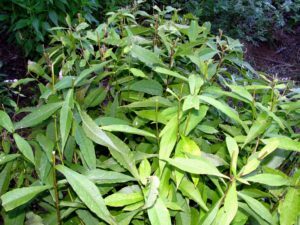 Herbaceous plants can be annuals (die each year) or perennials (return from the roots each year) and are divided into cool season (dormant during the summer) or warm season (dormant during the winter). This means at some point they will either be dead or dormant. Certainly we understand that they need cutting back at this point. And most gardeners understand the concept of deadheading (removing spent flowers) to tidy up plants and to promote re-bloom. But what most gardeners don’t comprehend is shearing plants back while they are growing; beyond traditional deadheading. By shearing I mean taking a pair of hedge clippers (I use both hand and gas powered) and removing the outer growth of the plant. 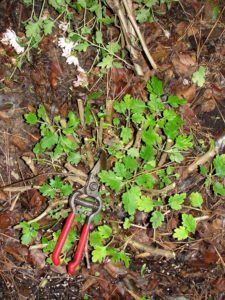 I’m often asked how much to remove and the answer is “It depends.” It’s generally only a fifth or third of the plant, nothing as severe as cutting them back when they are dormant. Sometimes I just shear the tips off of them. So what’s the shear fuss about? Shearing herbaceous plants makes them dense and full, shapes them into their spaces, and produces exponentially more blooms than if they hadn’t been sheared. So think of it as investing your money in the stock market. Who wouldn’t want more blooms if they had a choice? But like saving money, action is required in advance and constantly thereafter. Annual plants generally don’t need a lot of shearing as most have been bred to be compact and tidy. But don’t hesitate to shape them with the shears as needed. 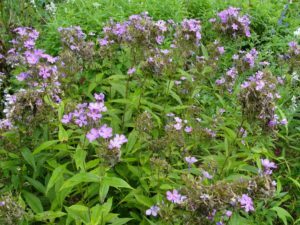 As a matter of fact, petunias and verbena need regular shearing to keep them growing into the summertime, otherwise they tend to bloom themselves to death in the heat. 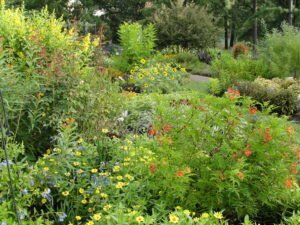 Most perennials need shearing, especially those that fall into the summer blooming and fall blooming camps. 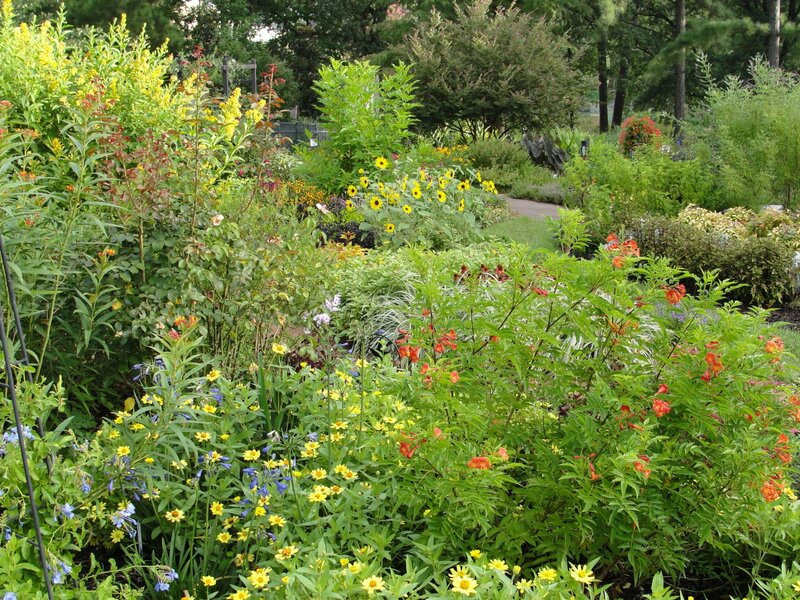 Let’s start with fall bloomers like aster, cigar plant, garden mums, Mexican bush sage, and Mexican mint marigold. When these flush out of the ground in the spring and are about six inches high, I shear off about one inch to make them dense. And I repeat this process monthly, shearing off about an inch each time to makes them full, sturdy, shapely, and prepare them for many more blooms than they would have had on their own. Just think of one individual shoot that would produce one bloom cluster. After the first shearing it would produce something like three shoots, then nine the next shearing, then twenty-seven the next. That’s how we get more blooms on more compact plants that are less prone to flopping. It’s important to know when to stop however. Although some stop shearing fall blooming perennials in July, I generally carry on until September 1. At that point nature takes over and short days transform our multitude of shoots into a plethora of blooms. 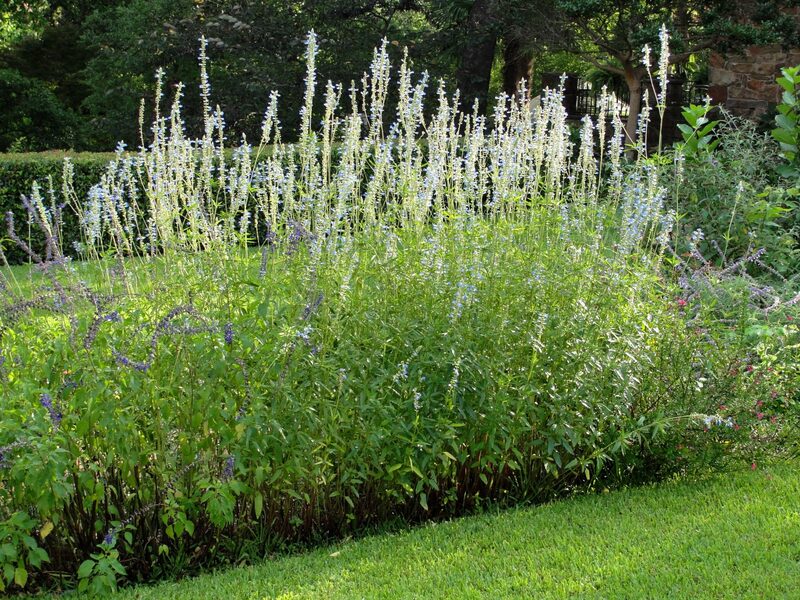 Due to our long growing season, our repeat-blooming summer perennials are often most in need of shearing. 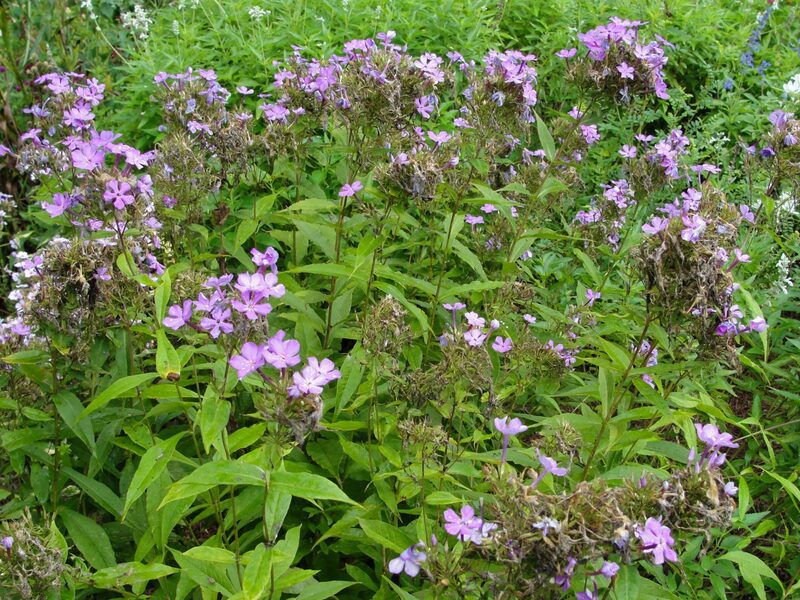 This long list includes garden phlox, lantana, butterfly bush, black-eyed Susan, coneflower, porter weed, Turk’s cap, esperanza, plumbago, and our many salvias. Like fall blooming perennials, these too need shearing when they first start growing and several times thereafter to produce dense, full plants. But their most critical need is shearing when they finish each bloom flush and certainly when they become overgrown and rangy. A good gardener won’t let either of these happen. Although my mentor Dr. Jerry Parsons says I’m wasting my time because “Nobody is going to cut their plants back,” I prefer to shear these plants before they finish blooming and before they ever get rangy because I don’t want ugly plants in my border. Yes, this means shearing off some scraggly blooms, but so be it. I’d rather sacrifice a few blooms to promote a clean looking plant that is going to re-bloom better and faster. Think of it this way. When you get roses for Valentine’s Day, nobody in their right mind would stick them in with last year’s dead blooms. And who wouldn’t want three dozen instead of one?